are you saying you want me to take BKK off the abrv key? No, no. It would be odd not to have both abbreviations there. Someone who is only trying to find out what an abbreviation stands for, apart from its association with an airport, may notice the Region Abbreviations legend first, and we don't want to confuse or disappoint them. I just appreciate the extra convenience of putting the BKK in the Airport Connections legend. I'm happy with that. grifftron wrote: ...what did you think of the HTMS key? Predatorius wrote: Minor suggestion: I would rename 'HTMS Chakri Narubet' to 'Royal Thai Navy' or similar. Most people would have no idea where to look for that territory, but if you name it somehting with 'navy' or 'fleet' or whatever in the name then people know to look in the blue stuff. Its called the HTMS.. Its the only Thai navy ship Thailand has i believe... it is called what it is called, look at pearl harbor, i am not very good with the names of all the boats but sometimes you just have to take a second and look where the terts are... just my opinion..
BTW, I live in Chiang Mai too! Small world. FarangDemon wrote: I think actually every flight from Chiang Mai to Phuket goes through Bangkok. I think almost every domestic flight in Thailand goes to Bangkok. One exception is Chiang Mai to Mae Hong Son. I do like how everything is centered around BKK (including the flights)... because BKK is massive, and you living in CM cannot deny the smallness of CM compared to BKK.. and CM is the next largest city in Thailand! Any other changes? I took the HTMS key off, just too much i think, not needed..
Hey hey, just a regular CC player here. Could the river between Sukhothai and Uttaradit be made clearer please? Right now the colour just blends in and looks like a normal border, so my partner and I never realised we couldn't make an attack through there. Something could be done to make it more contrasting. Did the legend need changing on both size maps? anamainiacks wrote: Hey hey, just a regular CC player here. Both maps have been updated, if these check out can we get them loaded up!? I have experienced an oddity that may stem from my monitor or other personal settings, or maybe from faulty XML. I'm not at all sure, but I'd like to clear it up in either case. Now, since I'm not sure whether it's on my end, I'm uncertain what you see here - but what *I* see is that Tak and Khanch is held by Orange. As it turns out, Tak is held by Red! Review the game log if you wish. Game 8730927. Shot was taken at round 5, red to play. 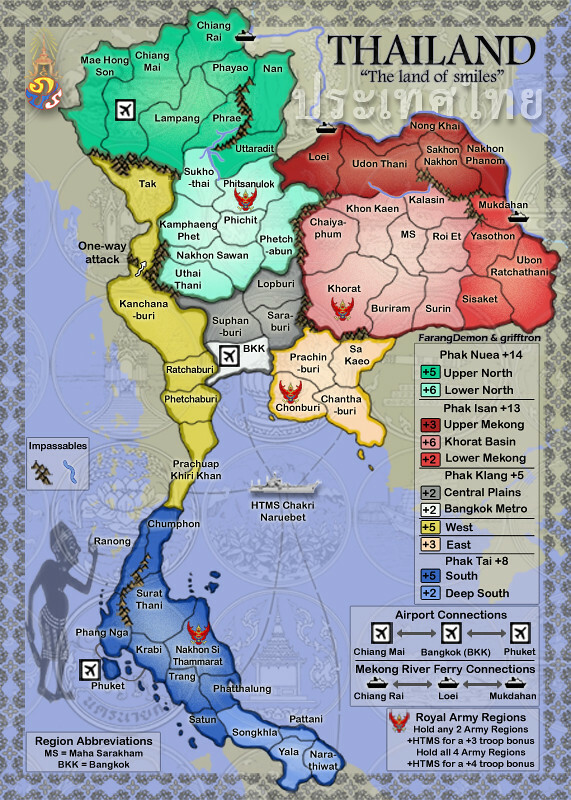 I can tell to perfection that red is holding the lower 3 territories in yellow area, but Tak looks like some sort of mix between orange and red - certainly it does not stand out as much as with the lower territories. Am I going selectively colourblind?!? 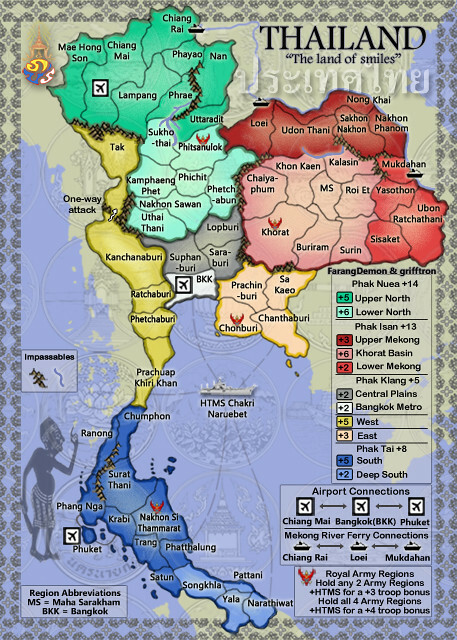 If by Khanch you mean Kanchanaburi, then I see that as the only orange troop number, while Sukhothai is blue, Uthai Thani is cyan, and the rest are red. Do you have some colour burn-in on your screen? Try scrolling. And when in doubt, use the colour codes. I have no colour blindness, but I use them all the time to counter the problems of contrast on some colours on some maps. You won't mistake "r3" for "o3". I might just to that, but I think many maps end up looking very cluttered with them on. So, if I might trouble you - could you follow the link and view the game with your own settings and tell me who appears to hold the 'Tak' territory? Riskismy wrote: I might just to that, but I think many maps end up looking very cluttered with them on. I also see it as red. I see red in all except for your little 1 too... sorry about the color blind thing, i don't know what the percentage is in the world of color blind people but its gotta be up there. No apologies needed. I'm not colourblind. The other red territories looked just fine and clear to me. I just don't understand where the diff in colours stems from. Perhaps I'm just colourfully optimistic. I'm afraid it's still not clear. I just made the same mistake playing on the large map. I came here to suggest a change and found these posts. My eyes are good, my screen is awesome and I've been studying/strategising over that part of the map for a day or two! It's easy to see once you find out it's there, but you don't spot it beforehand. Looking closely at both images here, I think it's clearer on the small map because it is thicker than the regular border. Perhaps that can also be done with the big map? OK, i made it a little wider and darkened it a pinch... hope it works good. Updated first post with recent map updates. First I want to congratulate you for this map, good job! I'm holding Chiang Mai and Phuket, Bkk is still neutral. The problem is: I cannot reinforce my troup from Phuket to Chiang Mai, even if they both have airport conenction. Is it normal? Do I need to have bkk to do it? Reinforcement only occurs along assault routes between and through regions (territories) that you hold. Phuket cannot assault Chiang Mai directly, so you cannot reinforce that way. If you held BKK, which can be assaulted by Phuket and which assaults Chiang Mai, you could reinforce that way (assuming chained or unlimited reinforcements: it's too far for adjacent reinforcements). In team games, you can reinforce a teammate's region if it is immediately adjacent to a region of yours that has the troops or that you can reinforce. You cannot reinforce through a teammate's region. So if a teammate held BKK, you could reinforce it from Phuket, but not Chiang Mai. The Clickable Map regions are off left, on the writing rather than the troop numbers. TheSaxlad wrote: The Clickable Map regions are off left, on the writing rather than the troop numbers.